I’m in the process of moving house which inevitably means I’m having to sort through the fifteen years’ worth of stuff I’ve accumulated since living here. This is a mixed blessing. On the downside it takes time and all of the decisions that need to be made are exhausting. On the upside however, it feels good to clear up and clear out. It also means I’ve been rediscovering bits and pieces I’d completely forgotten about and lots of memories have resurfaced. One such item was the cookbook Ann Carr’s Recipe Collection. It was a gift from Kath at The Ordinary Cook several years ago and had been sitting under a dusty pile of books, lost and forgotten. As soon as I opened it, I saw several recipes I was keen to make. My eyes quickly fell on Mayoress Cakes. Well there’s no story attached to know how this crunchy traybake got its name, but as soon as I saw the ingredients I knew it would be good. 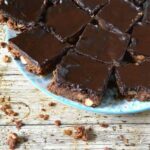 I remember making something very similar a few years ago, these chocolate and coconut bars and they proved to be very popular. As usual, I ended up doing my own thing and used the recipe as a rough guide only. I’m trying to use things up in my kitchen and not buy any more ingredients. This meant I added more than double the cornflakes, less than half of the coconut and a whole load of nuts that weren’t in the original recipe at all. I also added cinnamon, which I thought would give it extra pizzaz. For the topping, I preferred the idea of a chocolate ganache type, rather than cocoa icing, so I made an indent into my chocolate stash too. Less stuff to lug in the removals van. As ever, I used less sugar than specified for both the chocolate crunch and the topping. The result is a scrumptious and very moreish traybake with attitude. Scents of cinnamon and chocolate baking found their way into every corner of the house. The chocolate crunch is rather crumbly so take care when cutting it. I found a serrated knife works best. CT, on the other hand, found grabbing a large slice and diving in worked best for him. Each to their own. An easy to make traybake with a crunchy biscuity texture. Nuts and cornflakes give additional crunch and the cinnamon and chocolate make it extra scrumptious. Place all the dry ingredients into a large bowl and give it a good stir. Pour in the butter and mix until everything is coated and well mixed. Press into a 9" (23cm) sq silicone mould or lined tin. Bake at 180℃ for 20 to 25 minutes, depending on how crisp you like it. Leave to cool in the tin. Add all the ingredients to a pan and set over low heat until everything is melted. Give it a good stir and pour over the chocolate crunch whilst it's still warm. Leave the crunch to cool and the topping to set. Will keep up to a week if kept in a cool place. This is my entry into this month’s We Should Cocoa. Do join in if you’ve made anything which features chocolate as a major ingredient. I’m also sending my chocolate crunch to Treat Petite over at The Baking Explorer. Likewise it goes to Bake of the Week with Mummy Mishaps and Casa Costello. This looks incredible. I used to love making desserts with corn flakes when I was a kid, but this looks like a much more grown up version. I don’t know if it’s a more grown up version, but it’s delicious and so easy to make too. This sounds like entirely the most fabulous tray bake and I am definitely going to be bookmarking this to make. Good luck with the clearing out and stop reading the cook books, just pack them away! Hahaha, sound advice, but so difficult to do. Do make the traybake, it’s a good one. oooooh this looks delicious and what a great way to incorporate cornflakes into a traybake. I bet the coconut and chocolate with the cinnamon added a delicious flavour to them too. I was looking through some of my cookbooks the other day, and thought that I really must start making some of the recipes – in my own way off course too! I don’t use my cookbook’s enough. I have phases of taking them to bed to read at night, then go months without looking at a single one. Thanks Anca. It’s such an easy traybake to make, you must give it a try. Very tempting with crunchy bottom and silky chocolate topping…heavenly! All the BEST with moving. Empty cake tin? That will never do. The cornflakes are essential for the crunch, but give a good flavour too. 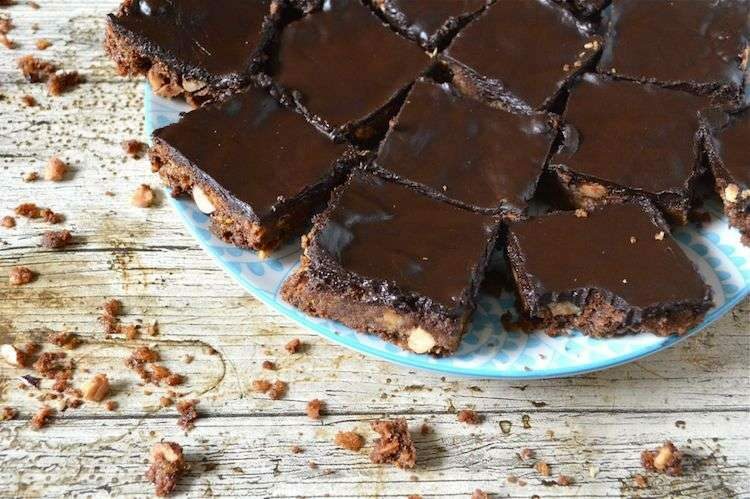 What a delightful traybake, with all my favourite flavours of chocolate, coconut and salt. I haven’t heard of the cook book or a Mayoress cake. The Mayoress Cake was a new one on me, but the concept was a familiar one. It was good to have a reminder though. good luck with your move – after 15 years it must be a huge job but also very cathartic. I love the sound of your slice – definitely ganache on top for me too – though we don’t have much of a chocolate stash as it goes too quickly here! Thanks Johanna, it’s getting quite close now and I’m, of course, not at all ready. Haha! I’m a bit of a chocolate hoarder. When I see a bargain, I tend to buy a load.